The following map is from (circa) 1871, according to this source, and it was published in Bologna, Italy. Could you please provide some context for it? Parts of the map are self evident, as for example the reference to the Alabama Claims, but others not so much (the fashionable crocodile in Turkey, for example). Larger version, from this blog post (a few other interesting maps there). This is a rough translation (work in progress). Notice that the text is rhymed, and some of it (I find ) it is illegible. 4 Ireland \\ Like the donkey with the habit \\ to walk close to the cliff hedge \\ And either comes back because of the staff \\ or ends up down the cliff \\ Likewise the problem seeking priest \\ mashes water in the mortar; \\ And he can be seen in glory and joy \\ What a fool!... Lo mash! Mash! If the meaning of 4. seems obscure, you are in good company. Perhaps it refers to the futility of Ireland's politics. Arguably the Catholic Irish did not approve the Italian conquest of the Papal States (1870). 5 Great Britain or Scotland and England \\ England, master of civilty \\ Gain teaches, (biting?) theory \\ Showing that civilized in this age \\ is only who has straight face and good tooth \\ She deceives and can trick the other countries \\ Long live the civilt; long live the English. Poland is the woman chained to Austria, Prussia and the Russian Nobleman. I think that this is a pun, because the Czar was called the Autocrat (from the Byzantine Autocrator, tranlating Latin Imperator). It might be also Antropofagus, but I seem to read a genuine "u" rather than "n". Could you please provide some context for it? 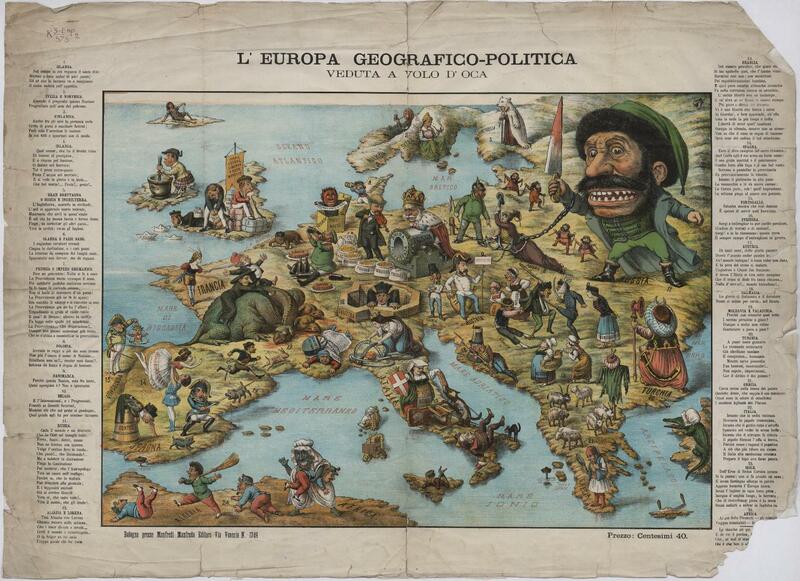 I think that it depicts Europe as seen by an Italian nationalist. The author obviously approves the recent (1870) Italian annexation of Rome. This is evident from what he says about "priests" and how he says that. Italy is the woman with long hair and white/turquoise dress, laying down a bear trap. The woman in the centre is Rome, that embraces/shields herself the coat of arms of the Savoy kings (of Italy). She feeds bread to a dog who is chained to the Papal seat: it is in fact on this chain that the pope tripped. And Italy prepares the wolf to the most sacred Crusade, where they will hold a parade. I think if there would be some Italian guy here and could translate all the sentences, it would be easier. Here's my try. In Algeria the Arab man represents French problems there. Of course Russia is bad so it is represented as an ugly butcher. Poland is divided by three states (notice chains). There are fightings in Balkans. The man kicking is probably Romanian and his opponent is Hungary. They are fighting for Transylvania. Rest of Balkans is still a part of Turkey, but they are guarded not by a shepherd, but a scarecrow. I think the crocodile represents Turkish control over Dardanelles, you can't cross river when there are crocodiles in it. They are slow on land, but very dangerous on water. In Italy the Pope is overthrown from his chair by Savoy dynasty. In Corsica there is still a monument of Napoleon. In Portugal the king could be a military's puppet. German sacks of money could be a French contribution after 1870 war, as there is a Prussian soldier "eating" Alsace and Lorraine and drinking French wine. Because the cannon has "Divina Providenza" written it can be reference to German claims in world or just Prussian in Germany. The three-headed dragon in France could be monarchy (which is adored by clergy and nobility or bourgeois), but will be thrown by a woman, Marianne I think. And as I wrote in my comment, such cartoon maps were very popular in 19th century, here and here (in the middle of the page) be the examples. Not the answer you're looking for? Browse other questions tagged europe 19th-century maps or ask your own question.